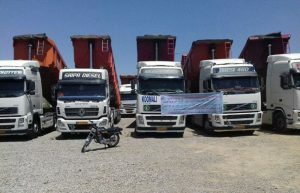 Based on news from MEK’s Network in Iran, starting on Tuesday, May 22nd, Iran’s truck and heavy goods vehicle drivers turned off their engines and went on strike. The statement from the National Council of Resistance of Iran (NCRI) states that the drivers working conditions have gradually deteriorated in recent years. High vehicle installment costs and low freight have put driver’s livelihoods under threat. The striking drivers wish to make their voices heard and end the economic turmoil of their current situation. NCRI reports, “The Iranian regime’s agents resorted to various measures to create disagreements among drivers”. In Isfahan, for example, the regime officials bumped up freight charges. In Bandar-Anzali, they increased the cost of shipping by 12% and the cost of bulk shipping by 17%, however, they could not break their strikes. In a time of severe economic hardship, these added costs are destroying the industry and putting many driver’s jobs at risk. The strikes were not limited to individual regions but affected the whole industry across nearly 100 cities in 25 different provinces, MEK reports indicated. The movement also received Maryam Rajavi’s support. On Tuesday, the leader of the People’s Mujahedin Organisation of Iran (MEK), urged the Iranian public to stand with the oppressed truck drivers in their struggle. The protest continued into its second day on Wednesday, May 23rd. Goods remained at a standstill in the 70 cities, and another 23 cities joined the protests. The movement offers an outlet for truck drivers to air their grievances with the regime and its actions. 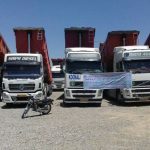 Meanwhile the NCRI statement on Thursday, May 24th, acknowledged that the nationwide strike of truck and lorry drivers on its third day has spread to 168 cities in 29 provinces of the country, and the number of trucks and lorries that have rejected loading goods are getting longer continuously. “This is despite the fact that intelligence agents have been deterring them from engaging in strikes since the very first day in various ways, including sending threatening SMS messages on the drivers’ mobile phones, and summoning some of them to the branches of Intelligence Ministry in their cities”. Reports from MEK network indicates that following the countrywide strike, many gas stations in Tehran and other parts of the country faced the shortage of gasoline. As a result, some of them are closed and some are just offering super unleaded fuel. The reports also indicate that as a result of the nationwide strikes the import and export process is also facing difficulties.